Across the country, supporters of U.S. Iraq War resisters have been working hard to ensure that the Liberal government acts quickly to resolve their cases and let them stay. Your letters, emails and phone calls have had a real impact – but we aren’t there yet. The Federal Court has given the government a deadline of September 16th to indicate whether the litigation against U.S. Iraq war resisters that was initiated under Harper will continue, or whether the Liberal government will stop pursuing Harper’s policies on this issue. 1. Contact Prime Minister Justin Trudeau to state your support for U.S. Iraq War resisters, and to ask that the issue be positively resolved NOW. The message can be brief, underlining that every day of delay continues the hardship imposed on these courageous conscientious objectors to the Iraq War by the previous Harper government. 2. Make a donation to ensure that the Campaign has the resources it needs to help war resisters stay in Canada. 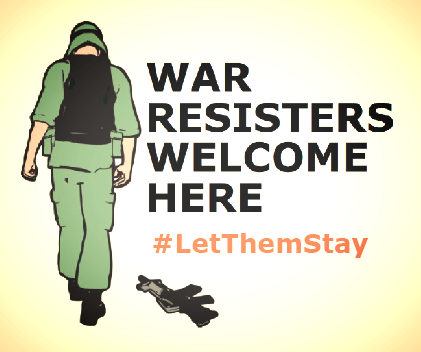 Send a cheque or money order made out to the War Resisters Support Campaign to: War Resisters Support Campaign, Box 3, 427 Bloor St. West, Toronto, ON M5S 1X7. Thank you for your ongoing solidarity and support! Please share widely!